The SFA team designed a new student recreation center for East Stroudsburg University to promote health and wellness among students. 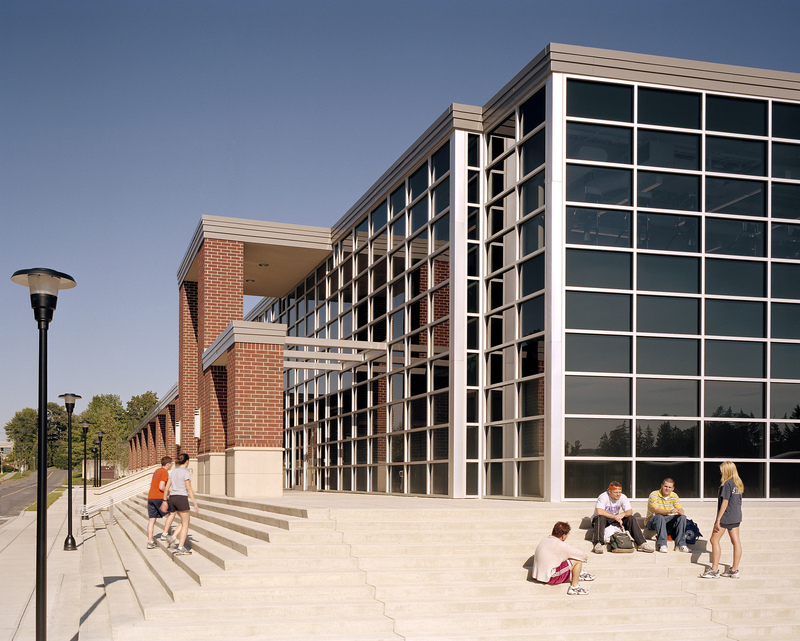 The facility provides a community atmosphere where students can achieve their fitness goals and recreational needs. For its new Student Recreation Center, East Stroudsburg University envisioned spaces that would support fitness and wellness while providing a safe, secure environment for students. ESU’s Recreations staff is guided by values to foster positive and healthy lifestyles, develop leaders, provide programming that meets the needs of all individuals, and collaborate with other departments and the community to promote their mission. The University also wanted the new building, the first in its long-range campus plan, to set the tone for subsequent campus architecture. To achieve the University’s goals, Spillman Farmer Architects created a student-friendly facility that presents an elegant and uplifting face to the campus. The exterior features traditional forms, with pitched roofs and brick and stone details. To add visual excitement, and allow for energy-saving natural daylighting, expansive glass walls highlight the front façade. Inside, the building promotes health and wellness through design and boasts a variety of recreational amenities, including a gym, fitness center, dance/aerobics room, and racquetball/squash courts. An indoor traverse climbing wall of transparent glass allows easy supervision of the numerous activity areas and multi-purpose courts from the central lobby and control desk. A central promenade encourages students to relax, enjoy a snack from the juice bar, and observe activities in the multipurpose space.